So...I got sick. Now when I can't work on the computer, I can often knit (and sleep, then knit again...) so I continued to keep the socks in progress on the bed with me. This brown & green is almost to the heel turn; the heel flap is, as usual, in Eye of Partridge stitch as reinforcement. Once the heel's turned, I'll switch back to the brown heather to pick up the stitches along the side of the heel flap and then begin the gusset decreases. 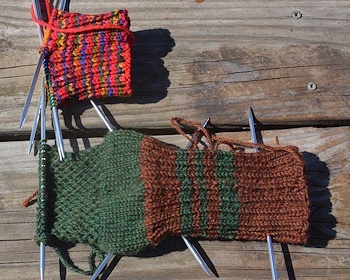 Like the ribbed cuff, the foot will be brown with green stripes, and then will have a green toe with a brown stripe. 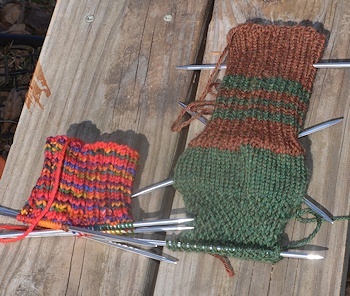 The other mixed-colors sock is about an inch along. Oh wow, I love both of these. Photos confirm that the colour you chose to compliment is just perfect. Yeah, they're very "woodsy," which is what I was hoping for. When I pulled this one on to check the length of the heel flap (I do that every time--gauge varies between yarns, as we all know) I really liked the look. Ready to pull on the old hiking boots and hit the trail. I need to go on and order more of the "Shire" green. I have an idea that it will also mix well with--hold onto your hat--a deep, rich purple. And also with a rich gold. And I may want a plain pair of it, as well. Right now all my greens but one (which is almost worn out) are the emerald green. Time for some variation. I also have a "forest green" and a "hunter green" to play with. Oh yes! It will go beautifully with a deep violet, purple or gold. In a way, now that you've mentioned gold, I see the brown you're using as contrasting in an almost copper shade against the green, particularly in the photo where the light reflects harder. Lovely, and very natural indeed. It can take several inches of knitting to confirm that two skeins of the "same" color aren't really--the Bitterroot Rainbow yarn is after all hand-painted, which means there is no batch number, and they may not match. They don't. I had three inches on the first sock, and as I reached 2 on the second, I realized they were not going to play catch-up at all. So...sock redesign. They're going to be a fraternal-twin pair of socks. Each sock will have 3" of ribbed cuff from the skein it started with, then switch to 3" of ribbed cuff with the other skein, then back (probably--there may be a test case) to its original for the non-ribbed ankle and heel flap, and then seven stripes down the foot alternating stripes of the "other" skein with stripes of four of the colors in the yarns, reversing the order from sock to sock, with the original skein as the toe. In other words, the difference in the skeins will look very purposeful. The other alternative, if I don't like the all-multi-leg and heel, is to use a solid color on the ankle, then do the heel flap in multi, picking up at least two rows of that on its side. The four colors I plan to use are red, purple, blue, and green, though if a certain slightly orangey yellow looks better when it's time, I might do that instead for one of them (and certainly will if I end up doing the ankle in a solid color with the multi-colored heel flap only.